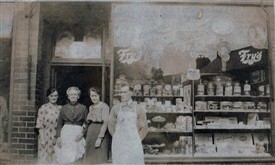 The photo shows Sarah Steggles, second from left, outside her shop in about 1920. It was originally built by Enoch Cresswell, along with others in the same block. It was later taken over by Sarah's daughter, Lucinda Reeve, far left, and was a bakers and general grocery shop. Linda, as she was better known as, sold the business in the late 1950's. She and her husband retired to a bungalow in St.John's Ave.
Harry Steggles, far right, later opened a successful pork butchers in Bulwell. Amy, second from right, became a school teacher. This page was added by John Reeve on 15/07/2015.